Bubble Shooter is one of the most addictive casual games ever! Featuring both puzzle and shooter genres and enjoyable bubble theme, this game was originally developed for Microsoft Windows by Absolutist Games in 2000. Shoot the bubbles to match the same colored ones - and enjoy the explosion fun! Bubble Shooter Premium Edition: top game for top players! Do you want to experience something new? Try Bubble Shooter Premium Edition: in this version of Bubble Shooter you will discover three themes (Underwater, Gems and Classic), eight bubble skins - and a beautiful screensaver with colorful bubbles, available after earning 50000 points! Get Bubble Shooter for Android! Bubble Shooter is released for Android! Android version of Bubble Shooter has finally gone live! Two game modes and a few difficulty levels offer deeper arcade experience for the true fans of this skill game. The version supports a number of resolutions, so you can play it both on tablets and smartphones. Looking for Bubble Shooter for iPhone? Bubble Shooter is available for iPhone! With two gameplay modes (Collector and Sniper) and four levels of difficulty, iBubble Shooter is our biggest gift for all the iPhone users around the world! 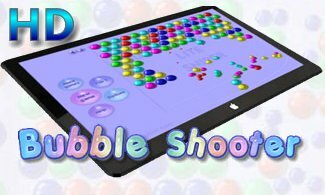 iBubble Shooter allows you to save your progress in the game, so you can come back to the bubble shooting fun whenever you want! Enjoy Bubble Shooter on iPad! Bubble Shooter has just arrived on iPad! The bubbles are getting bigger and better on your iPad! Much higher screen resolution allows easier, more precise targeting. Bubble Shooter HD also supports 'Rotation Lock' feature: you can play this game in any position you find comfortable! Try Bubble Shooter for Android! Try Bubble Shooter for Palm! Try Bubble Shooter for Pocket PC! Try Bubble Shooter for Symbian! Try Bubble Shooter for Linux! Like Bubble Shooter? Spread the word! Beadz! Beadz! 2: Under the Sea Blockz! Brickz! Brickz! 2 Step by Step Bubble Popper Bubblez! Click-o-Trickz! Clickz! Clusterz! Coinz! Connect Fivez! Dicez! Digitz! Dropz! Dropz'n'Heartz! Finger Physics Fitz! Frescoz! Gemz! Glassez! Glassez! 2 Hitz! Hitz! 2 Internet Community Jet Ducks Linez! Linkz! Mysteriez! Mysteriez! 2: Daydreaming Numberz! Patchgirlz! Patchworkz! Patchworkz! X-maz! Searcherz! Shumujong (digitz mahjong) Sumz! Tangramz! TriPeakz! Triadz! Twinz! Well Mahjong Well Mahjong 2 Internet Community Well Sudoku Wordz! Xonicz! Play online at our free flash multiplayer games portal - WellGames.com! if you don't have one). Among flash multiplayer learning games there are word games, games for kids, puzzles, arcades and other funny games. We are free, always online, and our flash game development team creates great unique addicting games for you. WellGames together with Absolutist Team invites you to join our gaming community and play our games for free! Here you can compete with your friends playing our brand new free online multiplayer games. Are you looking for addicting and funny games? You are at the right place to enjoy our cool games! Become a member of our gaming community, our cool games will bring you a lot of pleasure. All games are family friendly, so feel free to play them with your kids. We love games and we love you!